Over the last few years we have seen an incredible growth in combat sports as the UFC (and MMA – mixed martial arts) have risen to mainstream popularity faster than any other sport ever has before. What’s behind this development? Are we really that attracted to brutal displays of power? Yes, without question. Combat sports are not like baseball, basketball or even football. Guiding a ball into a net is a simple concept that easily translates to cultures afar but as more rules and abstract complexities are added, the more difficult it is for that sport be understood and accepted by different cultures. In American football, most non-Americans will laugh and lose interest when you explain rules like touchbacks, safeties or why there are four downs. Nothing translates quite like, say, getting punched in the face. It requires no language and few rules, because this is something we all innately understand. When we someone get hurt, we feel pain, and when we see a gladiator emerge through unlikely odds, we feel triumph. 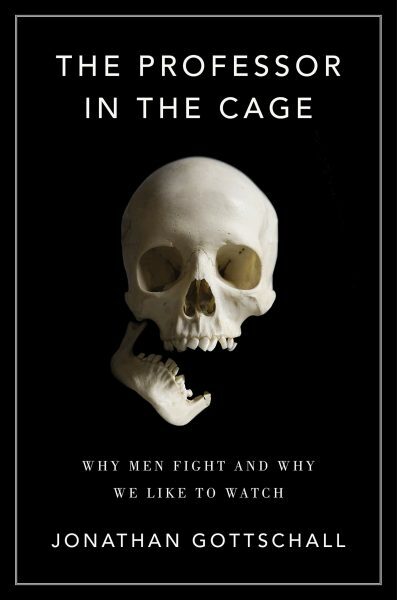 To learn more about this, I sought out this book, authored by an academic named Jonathan Gottschall who begins training and competing in MMA as he embarks on a journey to learn about the history and culture of human combat. One of the most surprising concepts presented in this book runs counter to a popular assumption about combat sports and its fans. And that is that combat sports are not just a reflection of our insatiable appetite for violence, but are a reflection our desire to keep real violence substituted with regulated, controlled combat. Long before the popularity of mixed martial arts or even boxing, men and our ancestors have participated in ritual combat, mostly duels and showdowns. We’ve done this to resolve conflicts and work out hierarchies amongst each other while minimizing carnage and social chaos. This combat, whether we participate or just watch, is also a form of catharsis which allows us to vent our aggressive impulses which have been sharpened by eons of evolutionary competition. Looking at combat in this way put a new twist on things for me. I have long observed that combat sports have a very well developed honor code. Especially among those who train martial arts, there is a distinct focus on earning respect through hard work and not wielding the strength you acquire irresponsibly. The author, in his training MMA, describes getting pummeled by younger fighters at his gym being a profound bonding experience. Violence has the power to delight us because it speaks to a part of our evolution as competitors that society has often sought to suppress. "Prisons are the most extreme honor cultures currently in existence. The harder the prison, the harder the culture of honor. And what emerges from such cultures is a lot of violence. In prison, inmates fight over tangible things such as control of a black-market economy in drugs, booze, and other contraband. But as frequently they fight over honor, although they usually don’t call it that. They call it respect. But honor and respect are different words for the same thing. They represent a group’s estimation of a man’s ability to inflict harm and confer benefits—of his power, in other words." "The qualities of traditional masculinity—bravery, toughness, stoicism—have less and less of a place in today’s society, leading some commentators to prophesy “the end of men.” But deep down men still need to feel like men, and so, like Quixote, we invent our own dragons. Taking crazy risks remains a prerequisite for manhood in most cultures, and if young men no longer take their risks in formal rites of passage, they do so on their own. YouTube offers an endless string of amateur videos from around the world, showing young men of all hues and shades accomplishing heroic feats of exuberant stupidity: Indian boys dodging hurtling trains, “urban climbers” hanging one-handed from skyscrapers high above Moscow, American boys performing Jackass stunts." "The Asian martial arts traditions function like quasi-religions: rooted in Zen Buddhism or Taoism, based on the legendary exploits of founding demigods, and usually tied to ancient beliefs about a magical universal energy called chi, which pervades everything but is beyond physical detection… They turned into combat faiths—complete with creation myths, violent sectarianism, and unwavering faith in spooky Jedi powers—rather than combat sciences. Science is about skeptically asking questions. Religion is about accepting answers on faith. So never questioning a senior, or a rule, or a technique, or a tradition—no matter how wasteful or illogical—is widely celebrated in the martial arts as a positive virtue. This is nicely illustrated in The Karate Kid (1984), when Mr. Miyagi teaches Daniel-san the value of mindless obedience by making him wax on and wax off for many painful hours." "Nature has designed boys to delight in rough play because it is important. It literally trains boys in combative arts. It teaches them how to wrestle each other for dominant position, both physically and verbally. It teaches them how to flee, chase, and tackle, how to hurl missiles and dodge them. It teaches them how to be brave and tough—how to flirt with danger and tolerate pain." "Without fighting, some of the poetry would go out of life. Without war—without the widows, orphans, and wasted young lives—there could have been no Iliad. Without war, Hector would have had no proper outlet for his valor, or Odysseus his guile, or Penelope her shrewdness or steadfastness. Without war, they would have had no reason to cultivate those virtues in the first place."